We Have Oodles of Suggested Uses for Our Interactive Art Prints! These 12" x 18" Interactive Art prints are copies of original watercolor paintings. They were created as the foundation artwork to be personalized by the recipient. Simply write directly on the print with a fine-tipped, permanent magic marker in the spaces - and around the design - of each print. And, Viola! This personalized artwork will look delightful hung on any prominent wall for display and enjoyment for years to come. Also, if the print is hung in a glassless frame, the owner of the print can choose to continue adding to the information, creating a piece of artwork that evolves and develops with time. Suggested occasions for use include – Weddings, bar mitzvahs, baby showers, bridal showers, anniversaries, birthdays, class or family reunions, graduations, teachers’ keepsakes, retirement celebrations, and even as a therapeutic tool! Use these interactive art prints to register names, dates, words of profoundness, silliness, gratitude, encouragement or whatever has meaning to you! Just for You – this print was created for you to personalize. Write down words with meaning to you! Words that inspire you! Include poems, sayings, single words, scriptures, positive thoughts and short quips. Frame your print and don’t put glass over it so you can continue to add to your Words of Wisdom. It will make you smile each time you read your special Words of Wisdom on and around your Wisdom Tree! These are also pieces of you that can be passed down from generation to generation. Birthdays – For birthday boys and girls of all ages…6 to 106 years ! As guests arrive, ask all them to write well wishes to the birthday honoree! Don’t forget to give the guests prior knowledge that they will be asked to do this on their invitation. Running out of room in the Tree? Then use the spaces around the tree. This birthday remembrance will last a lifetime! Weddings – The Perfect Guest Registry! Custom frame the print and leave out the glass so guests can sign their names AND Words of Wisdom (WOW) to the bride and groom! After the wedding replace the glass and hang the framed registry as a precious memory of the guests, the day and the vows that were exchanged! Baby Shower and Bridal Shower – Who can resist giving encouraging Words of Wisdom to the soon-to-be Married Couple and/or Mom and Dad! Frame and hang the completed print in the new baby’s room or newlyweds home!! Retirement – Ask farewell attendees to write their well wishes on the Wisdom Tree and sign their name. This keepsake is a lasting remembrance of friends and coworkers that is so much more meaningful than a handshake or pat on the back! 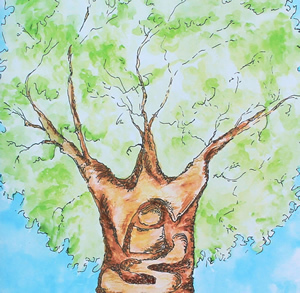 Mother's Day and Father's Day – Pass the Wisdom Tree print to all the family members and ask them to write something personal (or sign for them if they are far away) and give this one huge “card” to the honored Mother, Father, Grandmother or Grandfather on this special day. Have infants in the family? Use their fingerprint or footprint and then sign for them, making little leaves in the tree! Family Reunion – Ask all of the relatives to sign, then gift the framed artwork to the oldest family member! Graduation – Graduates…Request your fellow classmates to write something and sign their names. So much more creative than writing in a yearbook! Don’t forget to write the year!! AND/OR ask teachers, principals, and staff to sign OR Teachers ask your students to sign and don’t forget to write the year of each particular class! Class Reunions – Encourage class members to write a little something, sign OR ask them to write the car they drove in high school or their nick-name to identify them! Therapeutic Use – The Wisdom Tree is an excellent tool to use for grief, abuse counseling and as an aide to deal with divorce and loss. Encourage the owner to write positive words that encourage them and are meaningful and supportive. They can also write the names of people they value, (alive, dead or absent); people who have made a difference in their lives as a reminder of the positive influence that remains in their heart. Dinner Party – Planning a gathering? Make this one extra special by asking each guest to bring a short poem, saying or a little ditty that they want to write on your Wisdom Tree and share with the other guests. What a glorious remembrance of your guests, friends, and the evening! Words of Wisdom or maybe all merriment and jokes…regardless…a keepsake from them to you! 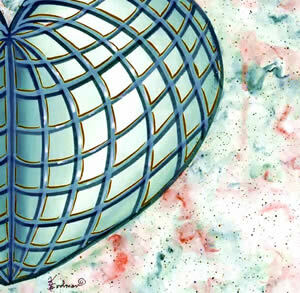 Just for you - this print was created for you to personalize. Write down the names of people, friends and/or family that occupy the Rooms in Your Heart. People that are special to you, inspire you and have provided a positive influence on your life. People who hold a “Room in Your Heart”. Frame your print and don’t put glass over it so you can continue to add to your print. It will make you smile each time you pass by and read the name of the people who hold a Room in Your Heart. Birthdays – For birthday boys and girls of all ages…6 to 106 years ! Ask all guests to sign in the “rooms” or spaces of the heart. Don’t forget to use the spaces around the heart for signatures. This birthday remembrance will last a lifetime! Weddings – The Perfect Guest Registry! Custom frame the print and leave out the glass so guests can sign their names in the rooms of the heart and around the spaces of the heart. After the wedding replace the glass and hang the framed registry as a precious memory of the guests, the day and the vows that were exchanged! Retirement – Ask farewell attendees to sign. 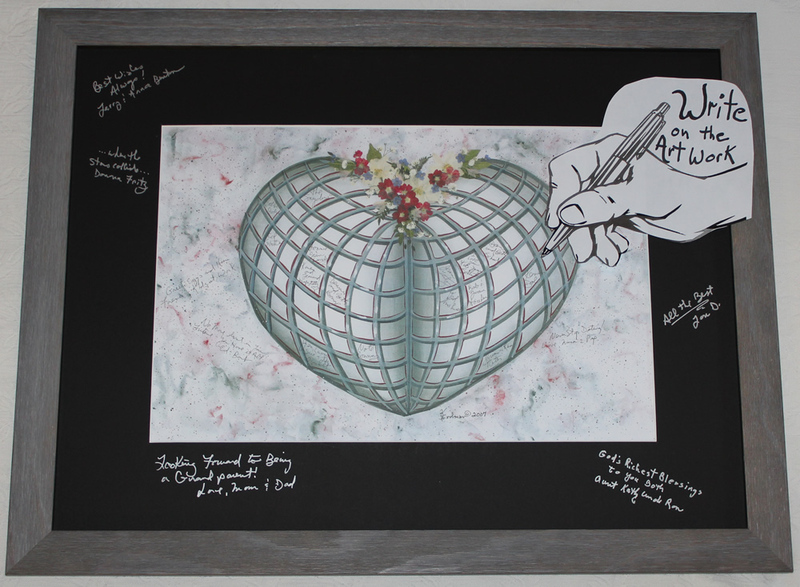 Mother's Day and Father's Day – Pass the Rooms in My Heart print to all the family members and ask them to sign their name (or sign for them if they are far away) and give this one huge “card” to the honored Mother, Father, Grandmother or Grandfather on this special day. Have infants in the family? Use their fingerprint or footprint and then sign for them! Graduation – Graduates…Request your classmates to sign their names AND/OR ask teachers, principals, and staff to sign OR Teachers ask your students to sign and don’t forget to write the year of each particular class! Class Reunions – Encourage class members to sign OR ask them to write the car they drove in high school or their nick-name to identify them! Therapeutic Use – Rooms in My Heart is an excellent tool to use for grief, abuse counseling and as an aide to deal with divorce and loss. Encourage the owner to write the names of people they value, (alive, dead or absent); people who have made a difference in their lives as a reminder of the positive influence that remains in their heart. And on and on and on! There is no limit to Interactive Art uses!